How much does it cost to travel to Cologne? How much money will you need in Cologne? €89 ($101) is the average daily price for traveling in Cologne. The average price of food for one day is €18 ($20). The average price of a hotel for a couple is €117 ($132). Additional pricing is in the table below. These average travel prices have been collected from other travelers to help you plan your own travel budget. How much money do I need for Cologne? Spanning the Rhine River in western Germany, the city of Cologne dates back 2,000 years, once existing as the largest city of the Holy Roman Empire in medieval times. Today, it is the region's cultural hub-a center of museums, galleries, and towering Gothic cathedrals. The Cologne Cathedral, or Kölner Dom, is perhaps the most recognized landmark of the city. It towers above everything with over 500 stairs up to the south tower. In addition, the city has a dozen more Romanesque churches open to the public some of which include St. Kunibert with beautiful stained glass windows, St. Andreas with 14th century frescoes, St. Aposteln with controversial paintings from the 1990s, as well as St. Gereon, St. Ursula, and St. Pantaleon amongst others. 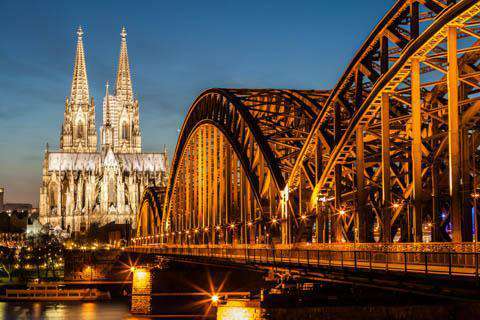 Other architectural sights worth seeing are the Die Kölner Synagoge, the Hohenzollern Bridge also known as the Locking Bridge as it is covered in padlocks that couples have placed there to pledge their love, and also the Rheinauhafen (or harbor) where there is a great mix of old and new. As with any city, there are a handful of parks to provide pleasant green space for visitors and locals alike. And then there are the museums and galleries-one of the world's best collections of museums and galleries for a city of its size. Some of these include world class museums of art and archaeology, two museums of ecclesiastical art, an ethnographic museum, a chocolate museum, and the German Sport Museum, as well as an abundance of Roman remains. Cologne is full of traditional neighborhoods or "Veedel" scattered throughout the city. One of the most notable is the bohemian Agnesviertel which features independent designers, bookshops, bars, and art galleries. Here you can spend the day sightseeing historical monuments, visit an exhibition, explore local markets, and wind down in a traditional pub or local café. Other "Veedel" include Ehrenfeld, Nippes, and the historical Südstadt. Old Town with its signature Cologne Cathedral, cobblestone alleys, and historic town hall is perhaps one of the most picturesque parts of the city-a great place to explore all day and then kick back at a brewery to take in the scenery. Cologne is a city of rich history and thriving culture. Once you've experienced the landmarks, galleries, and museums, you can delve into its ethos of today enjoying the shopping, dining, and nightlife. Germany is known for its festivals, and Cologne has a few like the Kölner Karneval-one of the biggest in the city. Occurring in February, this winter carnival holds an annual parade and accompanying festivities. There are also many Christmas Markets held throughout December, the most famous being the one close to the cathedral and the one at Neumarkt. Here you will find many local crafts, brews, and foods to warm you up in the cold winter weather. Other attractions of Cologne include the zoo and aquarium, the Phantasialand amusement park, Kölner Seilbahn which provides cable car rides across the Rhine River, and Claudius Therme which features a series of indoor and outdoor pools and saunas. River cruises and city tours are also popular. Being a large city the cuisine of Cologne is rich and diverse with anything from Middle Eastern, Asian, and Italian to the more traditional local foods of the region. Some of these include dutch gouda cheese on a rye roll called halver hahn, a dish called Himmel und Äd mit Flönz which consists of a fried blood sausage with mashed potatoes, apple sauce, and fried onions, as well as the famous Sauerbraten which consists of a link (beef or horsemeat) marinated in vinegar with raisins, usually served with red cabbage and a kloss (potato dumpling). Pig's legs (Schweinshaxe or Hämchen) are also popular as are potato pancakes (Rievekoochen or Reibekuchen) sometimes served with apple sauce or horseradish. Most traditional German dishes are hearty and rustic, usually found in local pubs throughout the city. Germany is also renowned for its brewing, and the typical Cologne beer is called "Kölsch." There are plenty of breweries and pubs throughout the city, serving kolsch and many other local varieties. Cologne Bonn Airport is about 15 minutes by local train the city center. It is served by both international and domestic flights and is a base for the low cost airlines Germanwings and TUIfly. Düsseldorf International Airport is about a 40 minute train ride to Cologne central station and offers many intercontinental connections. Frankfurt Rhein Main International Airport is the largest airport in Germany, and is served by all major international airlines. Inter City Express high speed trains connect Frankfurt Airport and Cologne central station in less than one hour. By train, Cologne is served by two train stations: Köln Hauptbahnhof and Köln-Deutz. The city is linked with Amsterdam, Brussels, and Paris by Thalys and Inter City Express High Speed trains. By car, the motorways Autobahns A1, A4, A3, A57, and A555 all lead to Cologne, though a car must have a "Low Emissions" sticker in order to drive around the city center.